One man’s junk is another man’s treasure or so the saying goes but whether it’s junk or treasure, when does it become just too much stuff? Last week I had a family medical emergency that had me, within hours, going from getting ready for work to flying hundreds of miles where I ended up standing in a small modular home surrounded by boxes and boxes of my parent’s treasures. They were in the middle of a move and the boxes represented years and years of accumulated stuff. The medical emergency has been taken care of but the boxes remain. What I most took away from this adventure of sorts is the need to be honest with oneself about stuff. We live in a consuming society. We are inundated by ads, sales, the new and improved and so we are tempted, if not brainwashed to acquire more and more stuff. This unfortunately is how our economy works, supply and demand, demand and supply, but over consuming has created many downsides. First, there is the obvious one of pollution. We are using up our natural resources at an alarming rate and discarding our refuse with little consideration of the negative impact we are causing the environment. Today we have massive land fills of garbage leeching into our ground water sources and oceans, full of floating plastic islands of garbage choking out our marine life. Second, we are in debt for all this stuff. North American’s have record high consumer debt. It always amazes me when I see someone who I know is financially stretched to the max, yet they carry the most up to date smart phone or wear expensive designer clothing. As long as the credit is offered they continue to consume as though it was a god given right to spend. 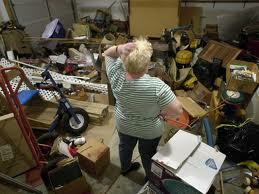 The third downside to accumulating lots and lots of stuff is the energy it creates. This may sound weird but think about it, if all the physicist are right, and they are, all matter is energy, so it would be reasonable to think that the more stuff you pile into your house, the more energy vibrations are pinging around your home. Some of this energy is good vibrations like the warm memories you feel when you look at an item that holds special meaning to you. Some of this energy holds useless vibrations because the items are no longer needed but continue to take up space on the shelf and some of the stuff clogging up your home may even hold negative energy such as the crutches that remind you of the trauma of a car accident, or the silent evidence of failure like the clothes hanging in your closet that are too small for you now that you have gained back that diet weight. As we clutter our private spaces with stuff, our personal energy becomes agitated. When our eyes have too much visual stimulation our brain has nowhere to rest. Our homes should be our sanctuary, a place that is peaceful and allows our spirit to be calm, rest and rejuvenate. How can our souls find peace in a space that represents a whirlwind of emotional energy? The lesson I learned from my recent experience was to be responsible for the items I acquire in my life. To be purposeful in what I possess. It’s not so much to do with less, although that is a major factor if we want to curb the consumerism madness, it is to think through any purchase you make and ask yourself; do I really need this, why do I want this item, will my life be easier because I own this, is there something else that I own that can do the job, what can I get rid of before I bring this item home? Being responsible for our possessions also extends to the burden that will be put on our loved ones when we pass on and they are left to sort through all that stuff. They are the ones that will be made responsible to determine what to do with it and how to discard it appropriately. You can’t take it with you. Do you want one of your last gifts to be the emotional baggage of the energy that resided in your home? Purging broken, unused, or outdated items is good for your soul. It frees up space in your life that held useless low vibrating matter and because the universe abhors a vacuum, choose instead to nurture your soul by filling your life with higher vibrating energy such as adventures and experiences that enrich your life with warm memories, wisdom and deep human connections that will last the rest of your life. Let your life legacy be who you were,what you did and who’s lives you touched not what stuff you left behind.